If you visited Seattle in summer 2001, you may have noticed some interesting street art: there were decorated pigs all around the city. This was a fund-raising effort by Pike Place Market. The pigs, of course, were in honor of Rachel, the life-size bronze piggy-bank who sits at the entrance to the market. 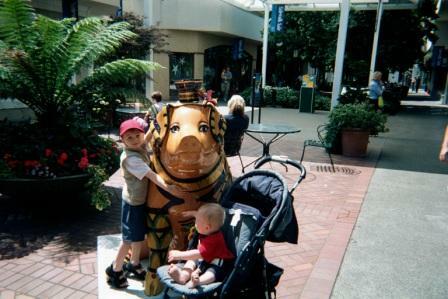 CAM and BigB (although he wasn’t so big then) with King Pork Cheops. 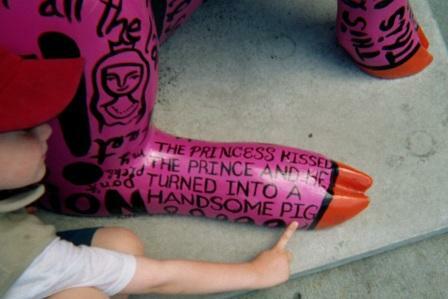 PigTales was CAM’s favorite pig. I think he just loved this twist on the traditional princess-kisses-frog story. You can see more of the pigs at the Images of Seattle website.